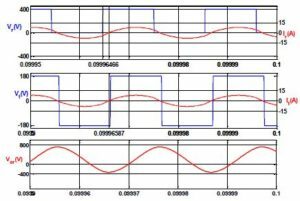 This paper presents an isolated LLC series resonant DC/DC converter with novel frequency adaptive phase shift modulation control, which suitable for wide input voltage (200-400V) applications. The proposed topology integrates two half-bridge in series on the primary side to reduce the switching stress to half of the input voltage. Unlike the conventional converter, this control strategy increases the voltage gain range with ZVS to all switches under all operating voltage and load variations. Adaptive frequency control is used to secure ZVS in the primary bridge with regards to load change. To do so, the voltage gain becomes independent of the loaded quality factor. In addition, the phase shift control is used to regulate the output voltage as constant under all possible inputs. The control of these two variables also significantly minimizes the circulating current, especially from the low voltage side, which increases the efficiency as compared to a conventional converter. Experimental results of a 1Kw prototype converter with 200-400V input and 48V output are presented to verify all theoretical analysis and characteristics. Fig. 1. Proposed LLC resonant converter. Fig. 2(a). Simulation waveforms of proposed converter under 400V input, 48V output and full load condition. Fig. 2(b). Simulation waveforms of proposed converter under 200V input, 48V output and full load condition. Fig. 2(c). Simulation waveforms of proposed converter under 400V input, 48V output and 20% load condition. Fig. 2(d). Simulation waveforms of proposed converter under 200V input, 48V output and 20% load condition. 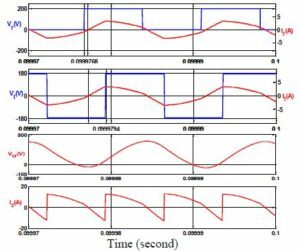 In this paper, a variable frequency phase shift modulation control for a DAB LLC resonant converter has been incorporated. This control strategy makes the converter operating at a wide gain range with ZVS over all load conditions. The combination of two half bridge connected in series on the inverter side reduces the voltage stress across each switch, which also makes the converter capable of operating at high-voltage applications. The voltage stresses remain half of the input voltage over all load variations. With the proposed control, the voltage gain becomes independent of Q and K values. Thus, the process of parameter design can be simplified. The magnetizing inductance has been calculated as high to reduce the conduction loss. It also reduced the circulating current (or, reactive power) from the secondary side even at light load condition, which increased the efficiency as compared to conventional DAB LLC resonant converter. The performance of the proposed LLC resonant converter is experimentally verified with 200-400V input and 48V output converter prototype. Therefore, the proposed converter becomes a good candidate for variable input and constant output voltage applications. Costinett, D. Maksimovic, and R. Zane, “Design and Control for High Efficiency in High Step-Down Dual Active Bridge Converters Operating at High Switching Frequency,” IEEE Transactions on Power Electronics, vol. 28, pp. 3931-3940, 2013. P. Engel, N. Soltau, H. Stagge, and R. W. D. Doncker, “Dynamic and Balanced Control of Three-Phase High-Power Dual-Active Bridge DC-DC Converters in DC-Grid Applications,” IEEE Transactions on Power Electronics, vol. 28, pp. 1880-1889, 2013. Krismer and J. W. Kolar, “Efficiency-Optimized High-Current Dual Active Bridge Converter for Automotive Applications,” IEEE Transactions on Industrial Electronics, vol. 59, pp. 2745-2760, 2012. Z. Peng, L. Hui, S. Gui-Jia, and J. S. Lawler, “A new ZVS bidirectional DC-DC converter for fuel cell and battery application,” IEEE Transactions on Power Electronics, vol. 19, pp. 54-65, 2004. Inoue and H. Akagi, “A Bidirectional DC-DC Converter for an Energy Storage System With Galvanic Isolation,” IEEE Transactions on Power Electronics, vol. 22, pp. 2299-2306, 2007. This paper deals with the design and simulation of full bridge LLC resonant converter suitable for photovoltaic applications. LLC converter has several desired features such as high efficiency, low electromagnetic interference (EMI) and high power density. This paper provides a detailed practical design aspect of full bridge LLC resonant converter. The LLC converter is implemented with a full-bridge on the primary side and a fu l-bridge rectifier on the secondary side. It includes designing the transformer turns ratio and selecting the components such as resonant inductor, resonant capacitor and magnetizing inductor. 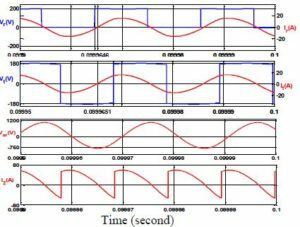 Also performance parameters such as voltage gain and output voltage ripple are calculated. Simulation of LLC resonant converter is carried out using MATLAB / SIMULINK and the results are verified. The design procedure of Full Bridge LLC Resonant Converter is presented for photovoltaic application. Theoretical values of resonant component values are calculated using the design equations. Simulation results are provided for LLC Resonant converter for an input voltage of 33V. The voltage gain and output voltage ripple of LLC resonant converter is calculated which shows that the ripple is less in the proposed converter. Abramovitz, A. and S. Bronshtein, 2011. A design methodology ofresonant LLC DC-DC converter’ Power Electronics and Applications (EPE2011), Proceedings of the European Conference, pp: 1-10. Bing Lu, Wenduo Liu, Yan Liang, F.C. Lee and J.D. Van Wyk, 2006.Optimal design methodology for LLC resonant converter’, Applied Power Electronics Conference and Exposition. Twenty-First Annual IEEE, 6: 19-23. Choi, H.S., 2007. Design consideration of half bridge LLC resonant converter, Journal of Power Electronics, 7(1): 13-20. Gopiyani, A. and V. Patel, 2011. A closed-loop control of high power LLC Resonant Converter for DC-DC applications, Nirma University International Conference, pp: 1-6. Senthamil, L.S., P. Ponvasanth and V. Rajasekaran, 2012. Design and implementation of LLC resonant half bridge converter’ Advances in Engineering, Science and Management (ICAESM), International Conference, pp: 84-87.